There’s something wrong with aviation. Suddenly, after making an amazing war record, the airlines have found themselves deluged with criticism. Air travelers, weary of delays and irritated by uncertain arrivals of planes, have begun to object. And their objections have been frequently and vociferously expressed. To date, the airlines have not been able to do much to help themselves. Keeping passengers sitting in airplanes for an hour, or two, or more, waiting to take off, has not made friends for the lines; nor has the business of “stacking” planes for long periods above congested terminals. A letter to a New York newspaper recently summed up the critic’s viewpoint thus: “Very few people live in a state of urgency that requires them to travel 500 miles an hour, and microscopic fractions of those who do can afford to trifle with the probability of being drastically late or set down in Framingham, Massachusetts, instead of Washington, D. C.
The airlines are well aware of the growing criticism; and draw some comfort from the fact that they still have a host of friends, people who think that in spite of handicaps the lines are doing a marvelous job. What are those handicaps, and to what extent are they the airlines’ fault? How much of the science of design, of traffic control, of instrument flying is being put to work to solve the problem? Strikes, seasonal reduction in transcontinental travel, greater east-west demand in transatlantic travel than can be handled, and general business conditions during the last months of. 1946 have hurt the airlines. But the outlook isn’t pessimistic, either for the lines or for you as a present, or potential, air traveler. They need critics—and equipment Specifically: The airlines have problems equal to, if not in excess of, any in American business today. They need criticism, from you and all other users, though they’ve had so much of it lately it’s not too welcome right now. But they need defense as well, and insofar as good, outspoken, defendants are concerned they’ve been at ceiling zero. The big lines were a major part of the Air Transport Command, so they’re all familiar with instrument flying. As an example, Northwest Airlines’ planes, on their wartime run to Attu, were equipped with every safety instrument the Army, Navy, and the airlines were able to devise. Northwest’s pilots on this run (notorious the world over for its bad weather) made a record that is something for Northwest to be proud of. Two round trips a day, day and night, almost always “on instruments,” were routine. And yet, pilots on this difficult run turned in better operating results than were being maintained over continental United States. Why were they able to make such a record? You know the answer: instruments. Radar instruments and others, plus landing facilities. The war’s over now, but the instruments are still there, and they are still doing the same marvelous job. The trouble is there aren’t enough instruments and landing facilities to do the job the airlines would like. All lines and their pilots want the same facilities that helped on the Attu run, and others. They want them right away. But you want a new car . . . you want another apartment . . . you want a new coat of paint for your house. You can’t get them. Neither can the airlines get the fields, approaches, instruments you think they should have for your speed, convenience, and safety. And they can’t get them for the same reasons that you’re on the waiting list. Take airports. Some cities have their airport so close to the heart of town you can get to it in a cab in five minutes. But there are often some pretty high buildings in these cities. So at a 1,000-foot ceiling, the minimum for landing with safety under these close-proximity conditions, only 60 percent of the airport’s actual facilities can be used. We’d all like downtown airports! Near by may be a city with even higher buildings, but with an airport so far out of town the buildings don’t count. Approaches can be made at a 500-foot ceiling and 98 percent of the airport’s facilities are utilized. Though everyone would like airports as close to the heart of town as possible, this isn’t practical for most large cities. We ought to have airports where landings can be made at 1,000-foot ceilings, and almost 100 percent of the time. This means instrument flying, the safest flying there is. Many pilots will tell you they feel safer, and have less concern for safety of their passengers, when flying fully on instrument. But you can’t get downtown in nothing flat, if you want a port with a 100-foot ceiling. Here’s what Don King, vice president in charge of Northwest Airlines Orient routing, recently told an engineering group in Minneapolis: “During the war, flying in zero-zero weather was no uncommon thing. Now the problem is to adapt equipment and methods to the commercial airlines, and get approval of the Civil Aeronautics Board. The adaptation is not too simple, will take time, but it will be worked out. King compared the airplane with the automobile. It wasn’t so many years ago that the automobile owner did little driving in bad weather, and put his car up in winter. In time these handicaps were overcome, so that driving an automobile came to be a year-round operation. Similarly, the airplane is developing to the point where it can be flown under any conditions. Outstanding steps in the development of aircraft for all-weather flying he enumerated as increase in size and speeds; researches in ways to forestall formation of ice on propellers, wings and empennage; use of such navigational aids as radar, localizer beam, fan markers, and Bartow approach lights. Airlines need trained personnel New planes? Planes with great improvements can be produced rapidly because it’s relatively easy to convert warplane research to peaceplane progress. Even so, it’s not nearly rapid enough to give the public what it expects from the airlines. People expect things of the airlines “yesterday.” That’s as much the lines’ fault as anyone’s. They get out some wonderful ads and publicity releases, and themselves believe too much of it. New airports are, to be more than colloquial, a horse of a different color. “We are not the masters of our own destiny insofar as airports are concerned,” one airline executive said recently. Sometimes the cities have no better facilities to offer and can’t enlarge what they have. Sometimes the co-operation between city, state, and Federal airline commissions and authorities is beset with all the handicaps such joint efforts involve. And currently the lack of building materials—and the price of construction when it is possible to proceed—affect airports just as they affect home building. The personnel problem is tremendous. The first half of this year domestic airlines alone carried 5,225,299 paying passengers, or 666,666 more than in all of 1944. Postwar traffic is 400 percent greater than wartime bookings. But the day of the 90-percent load factor is over. The airlines will have to be able to make money on normal load factors: somewhere between 65 and 75 percent. Trouble is, the industry has been growing in a jack-and-the-beanstalk way. It can’t get people; those it can get, it can’t train as easily or as quickly as in the past. And they’re working under pressure at all times. Telephones can’t be installed fast enough to handle one-fifth of the calls for reservations. This telephone confusion is only one of the hazards to public relations that gives us all a reputation for interring the word courtesy in quicklime in an unmarked pauper’s grave. Building an airline is a two-way process, involving men and women as well as materials. To build an organization in a hurry can cause greater headaches than all your material and construction problems combined. They’re getting down to business So what happens? And what’s done about it? Suddenly all the grouse and grumble you’re hearing from disgruntled passengers and writers is brought to a head by, let us say, a plethora of unfavorable articles. Everyone who travels regularly is having his trouble getting service anywhere. It’s only human to think of your troubles, and to forget someone else’s. When it became hard to buy a plane ticket, seasoned travelers simply said, “To hell with it,” and tried the trains. Airline traffic slumped. Winter, the airlines’ poorest season, set in and caused other setbacks. Under such circumstances, aviation stocks, good and bad, take a slide. These are contingencies any sound business must expect. Hoping they’ll never come, but knowing they always happen elsewhere and in all probability always will, the airlines have to meet them in stride, just as automotive and other industries meet their occasional setbacks. The airlines have had to grow up. Fast, too fast, it may be true. But from now on the science of aviation will be the business of aviation. The airlines won’t be able to run to Uncle Sam or cry “uncle” to anyone else. They’ve got to get down to earth and meet competition on its own grounds—the grounds of good business. It’s good business to have long-term fare-reduction aims, and to become as competitive with the railroads and steamship lines as possible. But it’s not good business to cut prices when airline costs, like those of anyone else, are increasing. No one expects automobiles to continue to advance in price indefinitely. Most automobile manufacturers expect that in a few years cars will be lower priced than ever before. But no automobile manufacturer is cutting his prices now; his business judgment dictates an absolutely necessary increase if he is to stay in business. The same is the seasoned judgment of the railroads and the shipping lines. The airlines should be asking for more instead of less at this particular stage of their rather meteoric existence. And all that’s said for air fares applies to freight as well. The 21-passenger DC-3 and the 42-passenger DC-4 that have served so nobly are going to be too slow, too antiquated, and too costly to run in a few years if the airlines are to live up to all the fine claims they’re constantly making in advertisements and publicity releases. Major lines are writing every one of these planes off as fast as possible. In their time they’ve done yeoman duty. Yet some of these planes had been hopped up in seating capacity in 1946, with DC-3’s carrying 28 passengers, DC-4’s carrying 60. When you pack air passengers sardine fashion, they howl. They have every right to howl. Regardless of rates, people have been led to believe air transport is something special, as advanced in comfort as it is in speed. Better planes are on order What planes will replace these old stalwarts that have been scientifically outmoded? On the shorter hops there will be planes like the twin-engined Martins, flying almost twice as fast as the still-standard DC-3s. They’ll carry more passengers per plane, all the instruments and other safety devices, including thermal de-icing. This means wing edges will be heated to eliminate an old hazard, icing on the take-off and in landing. For the longer coast-to-coast and trans-Pacific runs lines will be using big planes like the Boeing Stratocruiser, the commercial plane that grew out of the famed warborn B-29, the Superfortress that shattered the Japanese mainland. Cabins will be pressurized, speed will be doubled. m All of these are improvements the airlines have to make. They have to move faster comfortwise and courtesywise than the railroads, because people expect more of the airlines than they do of the other carriers. Any reference to the railroads suggests a parallel in aviation. Did it ever occur to you that trains run on instruments just as planes fly on them? The block system on railroads is not only an automatic wreck-preventer, but is also a system of control that can put six times as many trains over a division as could be routed through before the automatic signal systems were installed. And in aviation, instead of stacking plane above plane at 1,000-foot intervals when weather closes in, airline operators need, and will get, a block system of their own. Slow take-offs can be as exasperating as stacking. It 1 often takes an hour to get a clear runway at crowded terminals. In the summer the passengers boil; in winter they freeze until the plane gets into the air. The answer to this? More runways. They’re coming, but they’re not coming nearly fast enough. Above is one of the most interesting aviation charts that the industry has developed. It was prepared by engineers of the Douglas Aircraft Co., and it shows the principal factors you want to know in the consideration of flight. At left, the various means of flight propulsion are illustrated. At top are curves involving significant characteristics of highspeed flight by airborne machines. 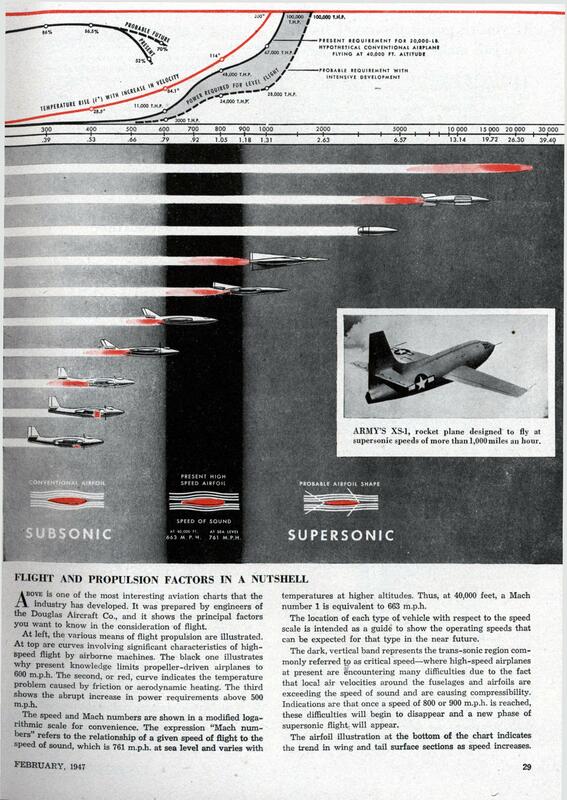 The black one illustrates why present knowledge limits propeller-driven airplanes to 600 m.p.h. The second, or red, curve indicates the temperature problem caused by friction or aerodynamic heating. The third shows the abrupt increase in power requirements above 500 m.p.h. The speed and Mach numbers are shown in a modified logarithmic scale for convenience. The expression “Mach numbers” refers to the relationship of a given speed of flight to the speed of sound, which is 761 m.p.h, at sea level and varies with temperatures at higher altitudes. Thus, at 40,000 feet, a Mach number 1 is equivalent to 663 m.p.h. The location of each type of vehicle with respect to the speed scale is intended as a guide to show the operating speeds that can be expected for that type in the near future. The dark, vertical band represents the trans-sonic region commonly referred to as critical speed—where high-speed airplanes at present are encountering many difficulties due to the fact that local air velocities around the fuselages and airfoils are exceeding the speed of sound and are causing compressibility. Indications are that once a speed of 800 or 900 m.p.h, is reached, these difficulties will begin to disappear and a new phase of supersonic flight will appear. The airfoil illustration at the bottom of the chart indicates the trend in wing and tail surface sections as speed increases. 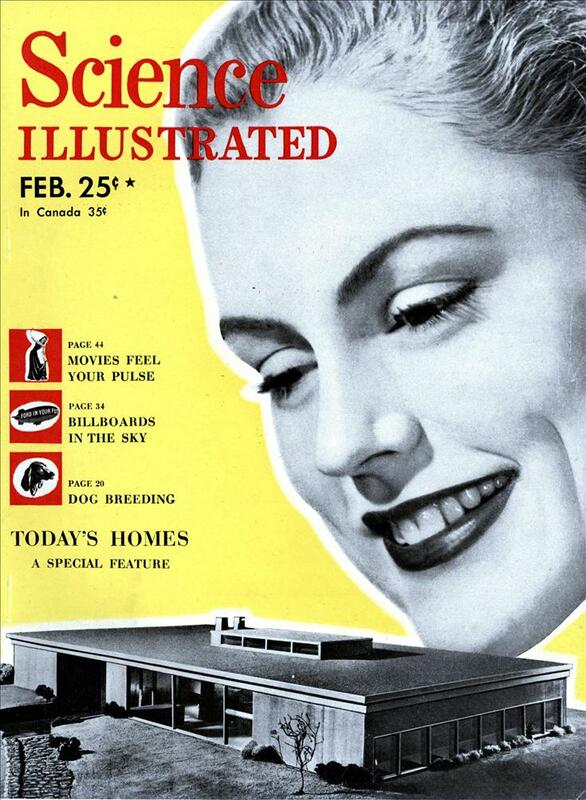 The Boeing stratocruiser was uneconomical to operate and Boeing only built 70 commercial models of that series. We would all like downtown airports. Not any more! We have one, and it’s growing. It’s got a “no jets” rule and restrictions on landing and takeoff times, and it’s on an island serviced by the world’s shortest scheduled ferryboat route (120m) to make it more difficult to get to (but not really.) But like I said, it’s growing. People are finally starting to measure flight times door to door, and realizing how much time they spend NOT flying. Then the slower regional turboprops that are downtown and actually easy to get to start to make sense. The article says that DC-3s are going to be too slow, antiquated, and costly to run and yet 400 of them are still in commercial service. That’s a heck of an endorsement for a design. The original Boeing SST, the 733, looked very similar to the B-1 but scaled up to have a cabin dimension similar to the current commercial jets. About the same time the stratocruiser came out, Convair made a transport version of the B-36, the XC-99. It was big, much like a propeller driven A380. A military themed airline could work except that the passengers would be required to wear parachutes! K’Ham: And Mae Wests instead of seat cushions that double as floatation devices. Maybe work in some “Why We Fight” shorts as inflight movies, too. BTW, “Zero Hour”, the movie that “Airplane!” was based on, was on TCM yesterday. Man, is that hard to watch without thinking of the Zucker Brothers version! Did they have an “Otto” pilot? Sadly, no. But it *was* a bad week to quit smoking. The world’s shortest scheduled ferry route is 120 m? You mean meters, not miles, right? Tom – yes, 120 metres, or about 400 feet. There’s two boats, the “Marilyn Bell” and some other. Ms Bell was the first person to swim across Lake Ontario, if I recall correctly. Toronto: And the other ferry is the David Hornell. The 121 meter distance is confirmed here http://www.torontoport…. Is it any wonder that private business aircraft became popular shortly after this article was written. As airliners and the traveling public became larger, smaller “city” airports remained accessible to smaller general aviation aircraft.